The suspect Hettiarachchige Asela Eranga (23) from Talgaswatta, Thelijjiwila in Akuressa has had direct connections to Madush. He himself is a wanted man to the police over several crimes. The suspect Eranga had been in touch with Madush via telephone and also been in charge of funeral arrangements of Madush’s father who died in a road accident late last year. 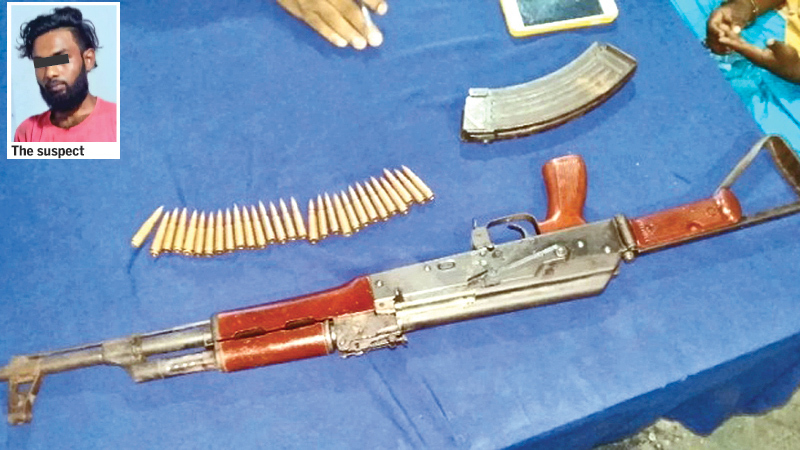 The suspect was arrested by Police while he was on his way to the house where Makandure Madush’s father lived in Sooriyawewa, Hathporuwa, to hide the T56 weapon belonging to Rotumba Amila, now in remand over a murder. Police will produce the suspect at the Hambantota Magistrate’s courts and submit the gun and ammunition for further investigations to the Suriyawewa Police.